Cycling in the Alps: Galibier, Morzine, Alp D'Huez, Joux Plaine, Colombiere.......all mythical stage places of the Tour de France. This week we're extremely fortunate to have Mike Booth as guest contributor. Mike owns luxury Chalet Annabelle in Chamonix and runs holidays year round so you can discover and enjoy the Alps in all seasons. Here he's given us a great round up of great routes for road bikers. Road biking is back in vogue. Lycra is trendy. With the achievements of Team Sky’s Manx riders Mark Cavendish and Peter Kennaugh, especially Cavs’ success winning the Tour de France Green jersey last year, then becoming Britain’s first World Champion in over 40 years, more and more keen road cyclists are heading to the French Alps each summer to battle with their own Tour de France. Access to the Alps has never been easier and once your bike has been dismantled and packed in a bespoke bike box (which you can hire or buy www.bikeboxalan.co.uk), you can be in the Alpine hub of Geneva within a few hours via Liverpool, Manchester or Gatwick or the new BA flight via London City. With the rising popularity of the cyclosportive market and many riders setting their sights on the Etape du Tour, Marmotte and Time Megeve cyclosportives, there are many challenges in the Alps to prepare you. 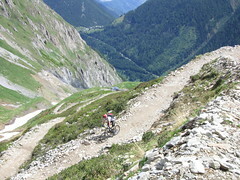 At the heart of the French Alps is the self styled extreme capital of the Alps, Chamonix, which in summer and early autumn offers access to many of the cols made famous by Le Tour, in addition to some local favorites and the ever rising popularity of the cyclists Tour du Mont Blanc (CTMB). The CTMB can be achieved in 2 days to 6 days depending on the group fitness and takes a circular route of Western Europe's highest mountain. Cycling firstly through France, onto Switzerland, over the Grand St Bernard pass to Italy and back into France. With a distance of 360km, 9000m of climbing, over 7 major mountain passes, Western Europe's highest peak Mont Blanc (4810m) is never far from sight. The road bike is an amazing machine and with the right gearing set up and a concerted training campaign it is it possible for the relatively fit cyclist with the right determination to conquer the Alps. The key to 'enjoying' your trip to the Alps is the critical choice on gearing. 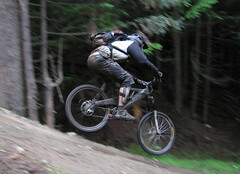 There is no shame riding a triple chain-set, or a compact set up and you are pretty much guaranteed to use every gear. If you opt against the advice, those with a traditional gearing set up to tackle the Alps will soon be lining the pockets of the local bike shop once in France! It’s widely acknowledged that Alp D’Huez is the climb most cyclists want to conquer and whilst its popularity and place in history is not questioned, there are many more Alpine passes which are both more challenging, and definitely more scenic. For me it would have to be the climb through the hairpin bends of the Col de St Petit Bernard from the Italian side, rising above the tree line and stopping for a quick cappuccino at the summit (2188m) before descending over the border back into France to Bourg St Maurice (820m) - after a few hundred meters on the flat you are climbing again over the Cormet de Roseland (1967m), surely one of the most scenic Cols in the Alps. Over the summit you descend towards the azure waters of the Roseland lake and into the famous cheese making valley of Beaufort. Mike, and wife Jude, own BreatheBike.com based permanently in the Chamonix Valley France. In 2011 Mike competed in Europe’s toughest cyclosportive, the Marmotte and finished in the top 10% of starters in the Etape du Tour Cyclosportive to the summit of Alp D’Huez. This year's Tour de France kicks off in Rotterdam on Saturday 3rd July and over three weeks will cover 3 643 km, including 6 mountain stages and 3 summit finishes. The first high mountain stage takes place on July 11th and takes in 189km, starting from the Station des Rousses, in the Jura north of Geneva, to the finish line at high altitude Avoriaz. 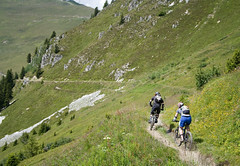 The final sprint will be the tortuous road that winds up to the resort from Morzine. Monday 12th July is the first of just two rest days for the riders. Tuesday 13th July is another gruelling high mountain stage starting out from Morzine and heading to St Jean de Maurienne. British hopes can focus on Bradley Wiggins and his new Team Sky - the first British Team to compete in the Tour for 23 years. Wiggins surprised everybody by coming 4th in last year's event, displaced from the podium by a returning Lance Armstrong. For this year's Tour he has been single-minded in his training and fitness regime - and has once again reached a target weight of 73kg, the weight that enabled him to perform well in the mountain stages last year. Leading the "Sky Train" to a podium place is not beyond the realms of possibility and in a recent interview Wiggins was quietly confident, saying that he was "in the ballpark" to win it. Whatever happens the Tour de France is an amazing spectacle and is followed with almost religious fervour. The stage towns on the route consider it an enormous privilege to be accepted as a starting or finishing venue, and pay a considerable price for it.The massive influx of visitors and business that accompanies the Tour circus more than compensates for the months of planning and preparation required. The atmosphere on the route is electric - with fans coming from all over world to support their riders. Despite controversy over drugs and doping, you can't help but be caught up in the atmosphere when the Tour comes riding through. For the small towns and villages along the way it feels like a holiday and a great reason for celebration no matter who is first across the finish line. So if you're lucky enough to be in the Alps or Pyrenees when the Tour is rolling through take the time to watch and enjoy it. It is widely acknowledged as the biggest cycling event of the year and the one that really matters! If you're looking for a place to stay in Morzine or any of the other mountain venues why not try the Summer Solutions room. In Europe the ski season is pretty much over and done with. Most of the remaining open resorts will be shutting down this weekend, and the last few stragglers next weekend. So that's it for snow skiing, and boarding, in the northern hemisphere. Or is it? All over the UK there are places where putting on your boots over the summer months is not that weird. The indoor fridges which have grown up in the last few years are the ideal places to get your snow fix and keep your skills sharp over the warm summer months. These snow zones, centres, and domes offer slope time, coaching, lessons for beginners and beyond, and have lots of fun events going on to entice you through their doors. See below for a quick round up. Opened last May, the Snow Centre is celebrating its first birthday next weekend, 8-9th May. To celebrate they are offering some great special offers - lift passes for just £10, or a 45 minute lesson for £15. Every Friday evening the centre plays host to their Freestyle Academy and stages "Park & Ride" events with a dedicated freestyle park and a rookie park for those wanting to try it out. Freestyle coaches will also be on hand to give tips and advice. You can see the park layouts on their Facebook page. The Hemel centre is also taking part in the DSUK 666 Skiathon on 18th May - an event which is running across all the indoor snow centres - where 6 teams of 6 will be aiming to ski 666 runs in just 6 hours to raise money for Disability Snowsport UK . Hemel offers lots of opportunities to improve your skills whatever your level and discipline and is also a centre for adaptive skiing. Of course you can just go along to enjoy the slope too! For more details take a look at the Snow Centre website. Tamworth's SnowDome was the first indoor ski slope in the UK. Billed as "the ulitmate snow, ice and leisure experience", Tamworth's dome also offers a gym, swimming pool and ice rink. Snowside events include some cool stuff; such as the Salomon Freeski Grom Camps for junior recreational skiers taking place over the summer. These camps are sponsored by Salomon and Oakley and are run by Pat Sharples, the Freestyle Ski Team Manager for those two companies. The camps cover all aspects of freestyle with coaching, video feedback and prize giveaways. Other events include snowboard performance courses, park nights,and airbag sessions to practice your aerials. You can also book a full day course in skiing or snowboarding, aimed at the absolute beginner to get you on your feet and sliding down on your chosen equipment by the end of the day. For all prices, dates and activities see snowdome.co.uk. Manchester's "all-year round Alpine village" is where you can ski, board, climb, shop and dine! As well as the slope the centre has a 12m indoor climbing wall to learn or practice climbing skills. This summer's events include the Fun Summer Race League. Over 4 Saturdays in May, June, July and August, skiers of all ages and levels can try their hand at ski racing in a slalom course - and either do a one off event or enter into the league and try all four races. There are prizes on offer for the winners but it's a chance as well for the recreational skier to experience the thrills of ski racing. As well as freestyle, airbag and other cool events, the Chill Factore also has the Monday Moguls sessions taking place twice a month from May onwards. Learn how to master moguls and have fun in the bumps with some useful tips and tricks from the experts. Get more information on Chill Factore! There are three Sno!Zones up and down the country offering summer courses, freestyle sessions, bumps sessions and much more. Events that stand out include Trickology at Castleford - designed for freestyle novice boarders and early intermediates. Snowboarders who would like to take their first steps towards learning a few tricks, or those that already know a few, but would like to improve and fine tune techniques, can get coaching on landing that jump or riding that rail. At Milton Keynes, the Maverix Snow Camp is a snowboard clinic devoted to progression in various park skills. Whilst in Scotland upcoming events include regular airbag events, and the Beginner Blowout, a weekend loaded with introductory lessons to skiing and snowboarding to get you hooked. Find out what's on at all the Sno!Zones. The message is that you don't have to wait till next winter to get on the snow. The indoor centres give you a chance to learn and practice on real snow, and can provide some great coaching and instruction too, whether you want to start from scratch, perfect some moves or try something completely new! We know we're always banging on about how great the mountains are in summer. Well in case you don't believe us, this week's post is a photo blog with some of the latest photos from alpine areas. Summer has really started now in most places, festvals, fireworks, music, cheese-eating - lots of things to do to enjoy the local colour and flavour. The traditions and heritage of the Alps becomes much more in evidence during the summer season when people have the time to relax and enjoy their surroundings. The photos below chronicle the early summer in Haute Savoie. Enjoy! And if you have any alpine photos you'd like to share please let us know. View of the Pointe Percee, les Aravis, taken from Flaine, Grand Massif. A traditional mountain restaurant in Megeve, on the walk up to Mont d'Arbois. Some great golf courses with the most impressive views can be found in the Alps. The gentiane - just one of the gorgeous mountain flowers that bloom in alpine meadows in the early summer. Early summer is when the waterfalls are at their fullest, with the meltwater from the winter snow. French VAT cut - eating out really is getting cheaper! As we already mentioned way back in May, the rate of restaurant VAT in France has been cut to 5.5% since July 1st. French restaurants are now obliged to pass on this reduction to the customer and accordingly have to reduce the price of up to a dozen items on their menu. CD HQ has heard of at least 2 establishments who have made the change. Aux Petits Oignons in Les Carroz, which reopens this week for the summer season, has lowered the the price on nine dishes, including a 1 euro reduction on the plat du jour, and 4 euros off on two off their Savoyard specialities. The restaurant is also hosting a special jazz dinner on the 14th July, and has a kids eat free offer during the week - where a children's menu is free when the Menu Carte is purchased by an accompanying adult. Bar le National in St Jean D'Aulps, near Morzine, has also made a splash with the announcement that "Bar le National has reduced prices on ALL PIZZAS....permanently!!!" The bar also has Ben & Jerry's and fresh salads at a cheaper price. So that's great news. If you know of anywhere else that deserves a mention let us know! 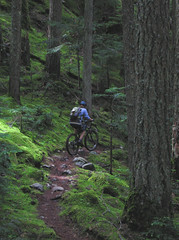 Summer seasons in the mountains - it's all up and running! As July begins pretty much all the mountain resorts in Europe are opening up, dusting off the lifts and gearing up for the summer season. So head to the Alps or Pyrenees now and you'll be pretty certain that the summer activities will be in full swing. Whilst the lower resorts, below 1200m, will have been able to start opening lifts, swimming pools, golf courses and other facilities during June, the higher places will have been ensuring that everything's good to go for this month. July and August can be busy for most resorts. Across French resorts, July 14th will be marked by fireworks and celebrations. Music festivals take place throughout the summer - the famous Montreux Jazz festival starts on Friday, and this year's line up includes Lily Allen, Black Eyed Peas, Bloc Party and veteran rocker Alice Cooper. Montreux goes on until 18th July and for the full line up visit the festival website. For sports enthusiasts the annual Evian Masters, one of the premier events of the ladies pro circuit, takes place from 23-26th July - it's a great chance to see the top female golfers in the world in action. Chamonix's International Climbing festival is from 11th-13th July, finishing up with a grand fireworks display and award ceremony on the evening of the 13th. Some resorts are also keen to attract visitors with some super deals - Portes du Soleil resorts for example are offering a Multi-Pass for just 1€ a day, giving you access to lifts, swimming pools, tennis centres and much more, and is available in all resorts across the Portes du Soleil; Les Gets, Morzine, Chatel, Morgins for example. And the weather forecast is good! It's looking like temperatures will be rising during this week and reaching the late 20's and early 30's. So loads to do, breathtaking scenery, great weather, sunshine, fresh air - what's not to like! Take a look at summer holiday possibilities on Chalets Direct. If you've got a special event happenign in your resort, please let us know about it so we can let everyone else know!